Last week, we examined some of the key trends at Digital Signage Expo, ranging from better displays, gesture-based 3D technology, touchscreen technology trends and the shifting role of digital signage. Now, let's examine a few additional trends related to the various verticals in digital signage and the industry itself. 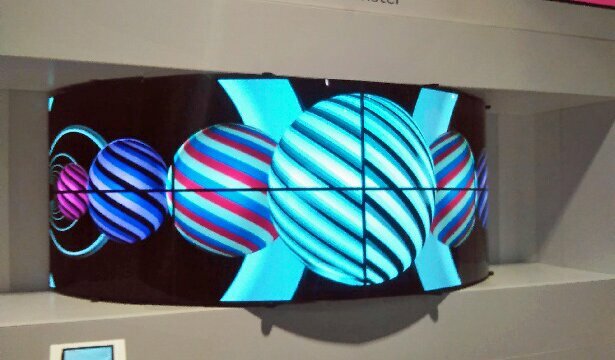 At the event, there was a large variety of different mounts for video walls on display. Some were designed to be more easily accessible for adjustments. Others could be displayed in portrait or landscape modes. In addition, bezels continue to get thinner by the day, which is a boon for businesses that want to avoid awkward video walls with thick bezels. Most booths at DSE featured some sort of menu board, kiosk or other restaurant solution. Customer experience is driving this push towards digital signage and QSR. Paul Murray, director of digital innovation from Dunkin' Brands, said in a previous story, "If this was a drinking game I would be drunk by now with every time I say experience." Rick Cook , senior manager of U.S. IT restaurant solutions at McDonald's, mentioned in a talk how the restaurant deployed digital signage to thousands of restaurants as part of an effort to boost customer experience. The technology is also gradually improving. Murray, for example, brought up the possibility of customized drive-thru experiences, where a customer's menu can be customized based on previous orders or specific requests. Olea Kiosks showcased an outdoor digital menu kiosk at the event, which allows customers in the drive-thru to order via the touchscreen or through a speaker. Outdoor kiosks in the QSR space are still a challenge, according to Cook, due to weather concerns and the need for 24/7 operation. Since most of the business comes through the drive-thru for QSR giants like McDonald's, the solution needs to be able to perform perfectly. Corporate communication used to be the "redheaded stepchild" of digital signage, Jude Carter, vice president of marketing for The Marlin Company, said during a session. However, now it is coming into its own through several ways. At a keynote presentation, Rich Ventura, vice president of business development and solutions at NEC Display Solutions of America, said if he could think of one word to describe the digital signage market, it would be chaos. Chaos, however, is not a bad thing, because it means the industry is constantly evolving. Ventura assured the audience that even a period as short as six months will lead to a large amount of change. When resellers sell a product that is six months old, the product will already appear to be a bit behind the times. Every time we believe the market has matured, something new emerges in the digital signage world.